THE WRITING BUDDHA - Opinions | Books | Movies: 13 Steps to Bloody Good Luck by Ashwin Sanghi (Book Review-4.5*/5)!!! 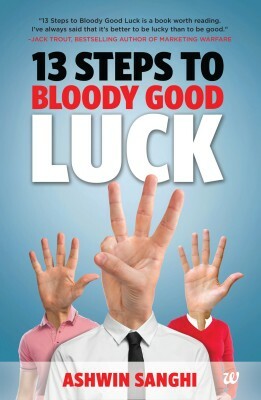 13 Steps to Bloody Good Luck by Ashwin Sanghi (Book Review-4.5*/5)!!! What happens when you a lot of efforts into something and still could not find yourself near success? The situation gets even more impatient when you find someone else with less seriousness and dedication winning it over you. The first thing that we do is blame our luck and abuse our God. Right? If you believe that luck plays its part in your success and failure and it isn't in your control but something that God has already written it for you, please go to a bookstore and pick up Ashwin Sanghi's first non-fictional attempt named "13 Steps to Bloody Good Luck". I have read only the last two books of Ashwin Sanghi and the kind of thrillers that he write, I was never expecting such kind of a non-fiction work by him. I had a conversation with him when he told me that he's writing a non-fiction and I thought it might become another wanna-be like Chetan Bhagat's What Young India Wants. But surprisingly, I am mind-blown and this book is surely going to change my life for sure. After reading Robin Sharma's motivational books, I generally do not find another self-help books as interesting as his but I can definitely list this one in the list undoubtedly. 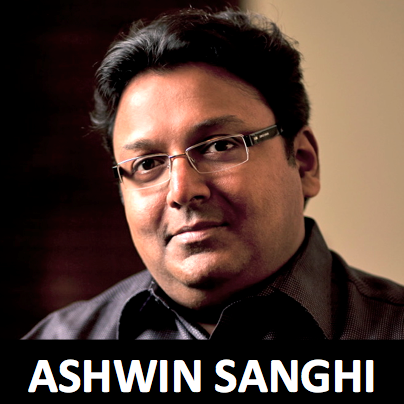 I liked the topic that Ashwin Sanghi has chosen for writing in a genre that he never tried before. His language has been so friendly and amicably good that it will help even a 10th std child to read this book and take out something from it. Right from the first page, the pace that the author has picked up is adventurous and it does not end until the last word isn't scribbled. A reader will find it not only hard but impossible to keep this book unfinished. I completed it in one sitting though I want to read it once again part by part on daily basis. This book surely has the potential of changing one's life and approach. The 13 steps that Ashwin has discussed as easy to implement and therefore this book is going to work with the masses. The examples that he has given on almost every page are so inspirational that you'll want to cut each of them and paste in on every wall of your home. From Facebook, Google, Flipkart, Whatsapp to Walmart, Ratan Tata, Ambani, Lakshmi Mittal to Amish Tripathi, Chetan Bhagat to Sachin Tendulkar and Amitabh Bachchan- Ashwin Sanghi has given every type of example to prove his point and make you believe that it's possible even for you. I also liked how he ended the book by discussing EQ and introducing LQ. The 14th step added in the end is also a wonderful post-climax. The best part is that Sanghi kept the book short and didn't make it 500-pages thick as mostly motivational books are sidelined because of their over-description and case-studies. Also, at Rs. 100, this book is GOD. Yes! And Amazon is giving it for Rs. 50. If you even once cursed luck for your failure, do read this book as you will know how luck is in your own hands. And mind you, don't think that the point has been over-exaggerated in a theoretical manner. It's not. It's as genuine as our casual talks. Get the book. I rate it 4.5 out of 5. GO FOR IT!!! Thanks Anamika. Very happy to find you back on my Blog..